You can earn 650 Bread Bucks on this product! Mixer may be turned on its side to accommodate a variety of attachments purchased separately. These include a meat mincer, vegetable slicer, blender, citrus press, strainer, grater, pasta discs, flake and grain mills and cookie press. The Assistent weighs only 19lbs. 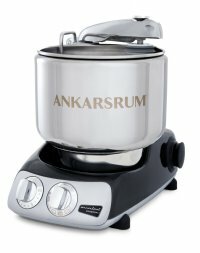 with stainless steel bowl and fits conveniently under overhead cabinets on most kitchen counters. Rubber feet and solid construction keep mixer in place during operation.